Bakersfield CA - Police were called today to the Kern County Fairgrounds to investigate an incident involving an Akita dog and a 9 year old child. The American Kennel Club sanctions the event, held by the Kern County Kennel Club annually. Thousands of exhibitors and spectators were in attendance.. According to witnesses, the child was walking near the show rings unsupervised when she suddenly came face to face with the 110 lb Akita dog. The child threw her arms around the dog's neck, reports say, when the unthinkable happened. The dog began enthusiastically licking the girl's face as his tail wagged briskly. "It was awful", said one bystander, "there was nothing we could do. That dog was just giving that child every once of love he had and no one did a thing to stop it". Another witness, who took video of the event, said "This happens all the time; I don't know how it hasn't made the news before now". One spectator, who declined to be named, told reporters "The sounds were just heart wrenching, all that laughing and giggling. It made me smile so hard my face hurts. I plan to sue for pain and suffering". The handler of the dog admits this is not the first time such an incident has occurred, and that the owners were "well aware of the stable, loving and patient temperament of this dog". She further admitted that she would continue to permit the dog to act in this manner in the future. The owners were unavailable for comment. 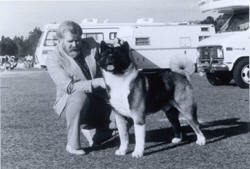 Akitas are a member of the AKC’s Working Group, a classification of dogs who are renowned for providing specialized services and tasks to their owners. Akitas, which originated in the Honshu district of Japan, were revered for their hunting and guarding abilities, intense loyalty, and are even said to babysit their family's children. Police state that the handler, who was noticeably unrepentant, was cited for Reckless Entertainment. The Akita dog was given roasted chicken treats and was not taken into custody.